We offer reclaimed rope doormats in mainly green or orange (because these are the colours the local lobstermen predominantly use). 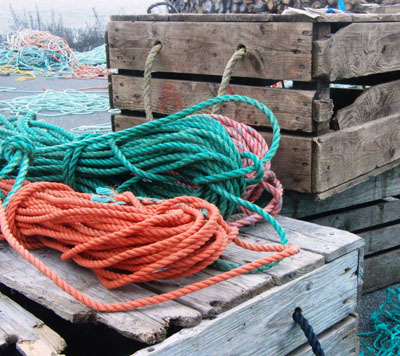 Occasionally we will receive yellow, red and a darker green or blue in reclaimed rope. Doormats are made from clean used rope and will display individual character and a somewhat distressed look. Doormats made from new trap rope come in a variety of brilliant colours. All mats are handmade and are woven on Grand Manan Island and the ends are fastened with stainless steel fasteners. Mats are colourfast, mold and mildew-proof and will not retain moisture. Please Note: Both reclaimed and new trap rope doormats are NOT Anti-Skid. Doormats should be secured or fastened on smooth or slick surfaces.